Mistakes in the operating room can result in death, serious brain damage or spinal cord injuries. 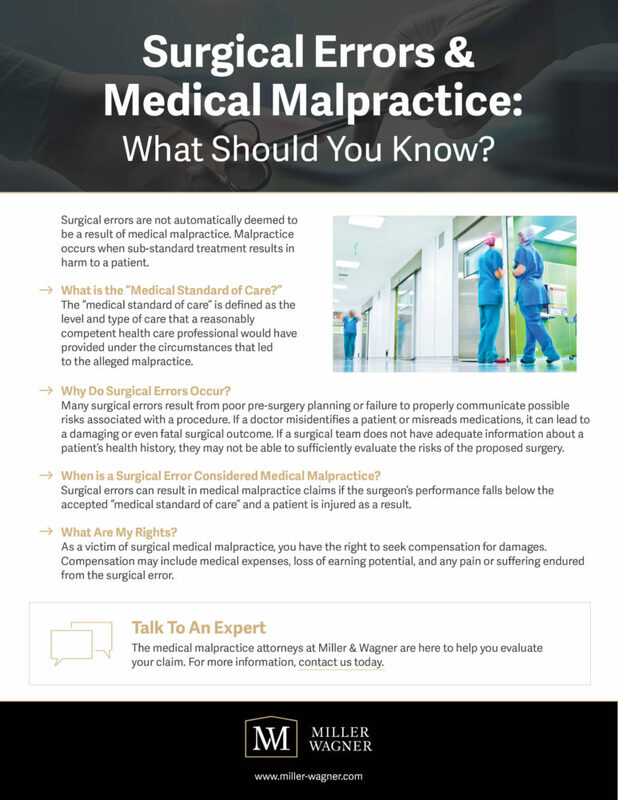 If someone in your family was injured or killed as the result of surgical malpractice on the part of a surgeon or other member of the surgery team, discuss your legal options with an experienced trial attorney. Contact the law firm of Miller & Wagner in Portland for a free consultation. In cases of surgical injury, we work with some of the Northwest’s most distinguished surgeons and anesthesiologists to determine whether a given injury or death resulted from negligence on the part of a medical professional, or instead reflected a properly disclosed risk of the surgical procedure. Whether the patient accepted the risk of a complication through the informed consent process is often a sharply disputed issue in surgical malpractice litigation.